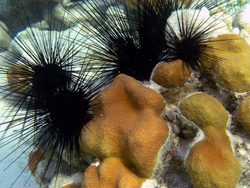 Urchins that are vital to stop algae growth. See video on bottom of post. The Andaman Islands are known for complex and beautiful coral reef ecosystems. These ecosystems are important for the islands’ eco-tourism and fishing industry. Red Skin Island, in the Mahatma Gandhi Marine National Park, is a beautiful recreational park with snorkeling and hiking. I got the chance to travel to the park, and check out what the reef there had to offer. I’ve been to reefs in different parts of the Caribbean, and remembered them to be colored with vibrant colonies of fish, so I was excited for my visit. However, the overall reef system at Gandhi Marine Park resembled that of a ghost town. 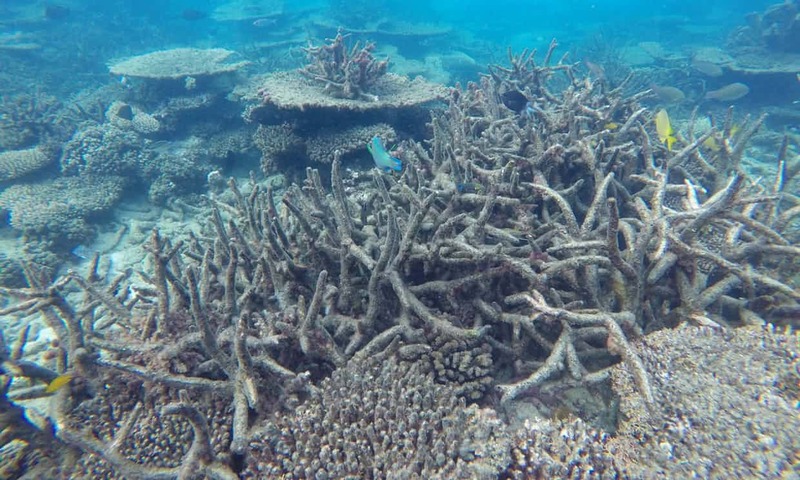 Hardly any fish could be observed, and the corals looked dead and green. It sent shivers down my spine, and saddened me. I was unmotivated to snorkel or dive, and continuously asked myself how could this be? I don’t remember the corals looking this way in the Caribbean, but why was this the case in the Andamans? I speculated that it could have been from the glass bottom boats stirring up sediments, or that the fish were scared from the excess amount of boats dropping off tourists. I did some research, and came to the understanding that it likely derives from global warming. Ocean acidification derives from the burning, and releasing of Co2 into the atmosphere. The ocean represents a carbon sink, and soaks up 25% of the CO2 humans produce every year. Since the industrial revolution our oceans have become 30% more acidic (Climate Reality, Global Warming’s Evil Twin: Ocean Acidification). This acidification can be a result of coral bleaching. Coral turns white from the effects of bleaching, and can eventually die from nutrient deficiency. This is because of a symbiotic relationship that takes place between the corals skeleton and zooxanthellae tissue. The zooxanthellae live inside the coral’s tissue and provide about 90% of the required energy for corals (What is coral bleaching, Great Barrier Reef Marine Park Authority). With the increase of temperature in the ocean, comes the death of this zooxanthellae tissue. Once this tissue dies, the corals bright calcium carbonate skeleton is revealed, giving the coral a bleached white look. Once the corals skeleton is revealed, the coral becomes susceptible to the growth of turf algae. This produces a mossy look, resembling that of an old sunken ship on the sea floor. Global bleaching occurred during the 2014 northern hemisphere summer. Corals in the pacific near Guam, and the Northern Mariana Islands started bleaching at an extreme rate. This bleaching slowly spread as the year progressed, around the pacific. However, the southern hemisphere summer exceeded bleaching like wild fire hitting coral in the indian ocean and the caribbean sea (Vox, How dead is the Great Barrier Reef?). My trip to the Caribbean was back in 2013 which could explain how bleaching is a relatively new problem. The Great Barrier Reef is experiencing bleaching on a massive scale. Producing a fragmentation of dead, partially dead, and living coral that make up the entirety of the Reef. 91% of the great barrier reef has been hit by bleaching (Independent, Rod McGuirk). Over the past 30-40 years 80% of the coral have died in the Caribbean, and 50% in Indonesia and the pacific (Skeptical Science, Anonymous). One percent of coral are dying per year, and will likely ramp up with the increase in climate change. Not only does this result in the loss of ecotourism, but also results in the loss of fish habitats. This will be detrimental to the world economy, causing an inflation in the worlds food prices. These reefs represent the rain forests of the ocean and house a wide variety of aquatic life. An example being the corals in Guam. These corals house 3,500 different species of plants and animals as well as 200 different types of corals (Teach Ocean Science, What lives On A Coral Reef?). Surprisingly, corals also protect against waves and storms which prevents property damage, erosion, and floods. This is an important function for coastal residents safety, because if excess erosion takes place then the coastline will continue to deplete until the sea resides in peoples back yard. Another issue for the coral is the rise in sea level. Zooxanthellae tissue feeds the coral through the process of photosynthesis. This is why coral reefs are situated in shallow, clear waters. This means that once sea levels start to rise, the coral reefs will be at a deeper depth, making it hard for sunlight to provide energy to the corals. Not only is climate change and carbon pollution a killer for coral reefs, but a lack in aquatic herbivores can be a challenge for coral survival. The parrot fish spend 90% of there day eating algae off the corals. However, these parrotfish are overfished resulting in caribbean reefs becoming overruled by algae. the healthiest reefs in the caribbean are ones that contain an abundance of parrotfish. No algae equals coral growth and success. (To save coral reefs start with parrotfish, Ayana Elizabeth Johnson). These parrotfish are colorful and easy to spot, however while in the Andamans these fish were practically nonexistent. Urchins also feed on micro algae and perform much of the same ecosystem functions as parrotfish. I noticed redskin had a severe lacking in Urchins. On the glass boat ride I only spotted about two urchins nestled in the cracks of the coral graveyards. There is still hope for these coral reefs however. Coral reefs will recover if conditions change in the favor for the zooxanthellae tissue to regain strength. The best answer to the problem is to cut back on fossil fuels, and to conserve the fish that provide important ecosystem functions for these reefs, such as, Urchins and Parrotfish. There is hardly any information on this global crisis as well. The death of coral reefs is a hidden message to what are future is destined to be. The bleaching/death of coral is a great refute to those who still refuse to believe in global climate change. Once we educate the people and stop casting blame, then I believe real change will come. The evidence of coral bleaching must be clear and upright for all to understand its significance. This understanding will then transfer over to many other problems we as a human race must face.